Skien is near Lake Norsjo, south-west of Oslo, and a few kilometres inland from Larvik. From the E18, turn onto the 36 to Skien. Follow this road through the town to the junction with the 357 and turn left onto the 357 in the direction of Skotfoss. Cross the bridge to the traffic lights then turn right onto the 32. Follow the 32 to the first roundabout and bear left in the direction of Valebo. At the crossroads turn left into Slemdalsgaten, then take the second turning on the right. The cemetery is at the end of this road. From the entrance follow the path to the left of the chapel, turn right and walk down the path behind the chapel. Then take the first path on the left. The Commonwealth war graves will be found along here on the right next to the path. 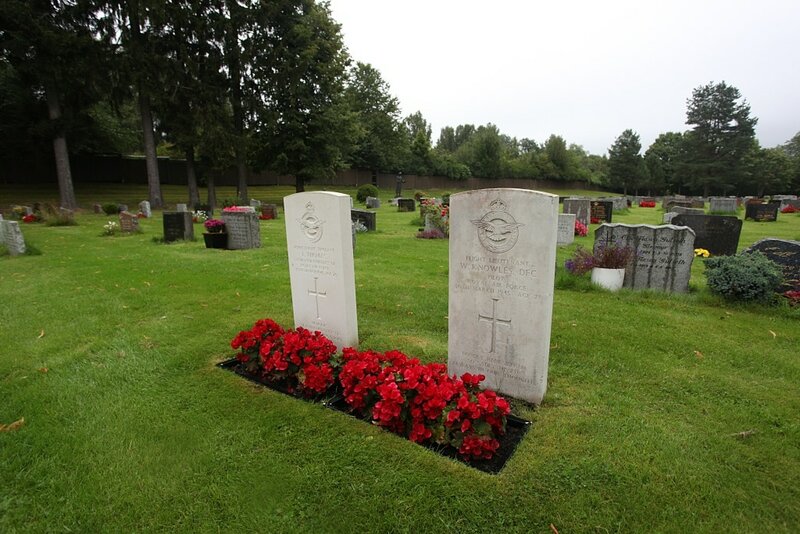 Skien Civil Cemetery contains the joint grave of two Commonwealth airmen. 102061 Flight Lieutenant William Knowles, D. F. C. Pilot in 235 Squadron, Royal Air Force Volunteer Reserve, died 30th March 1945, aged 28. Son of William and Maria Rebelo Knowles, of Carcarelos, Portugal. 1451698 Flight Sergeant Lawrence Thomas, Navigator/Wireless Operator in 235 Squadron, Royal Air Force Volunteer Reserve, died 30th March 1945, aged 23. Son of William Charles and Ann Maria Thomas, of Grimsby, Lincolnshire.